A couple of weeks ago, I attended a reading hosted by the Toronto Romance Writers. Called A Night out with Authors, the speakers were Mary Sullivan, Molly O’Keefe and Susanna Kearsley. The venue was a warehouse like place on Brunswick Avenue (downtown) called the Tranzac – the Toronto Australia New Zealand Club. Basically, it was an open room, sort of like a low-ceilinged high school gym, with a bar to the right and a large stage in front of a few dozen card tables and hard plastic chairs. Zero atmosphere, zero trendy touches for such a hipster neighbourhood, but the sound system was great and the three ladies were amazing – funny, informative, friendly. It always surprises me when I buy something simple like a middling glass of wine (Fuzion) and it costs $6.50, plus the tip, which makes it $7. A bottle of Fuzion at the LCBO is under $8. Good grief. Yeah, I’m frugal when it comes to stuff like that. I don’t understand how barflies and pub crawlers can afford to imbibe for hours at a time and not go broke unless, of course, they sneak out to the sidewalk to panhandle between sets or they make one glass last all night or they get some poor schmuck to pony up for their beverages in hopes of a ‘happy ending’ after last call. Of course, I checked out the facilities on the way in (it’s a long ride on public transit) and on the way out (ditto). I guess because of the location and the type of artsy acts they host, I should have expected the Club to have funky washrooms. They were clean and stocked with paper, although there was a surprising amount of graffiti. On a positive note, reading the creative jottings helps one to pass the…um, time … in the little metal stall. What is it about sitting down to do their business that prompts some folks to wax existential? What about the angst about “the grip”? Well, the advice was to “have an affair and see what it’s like first”. Practical and sensible. 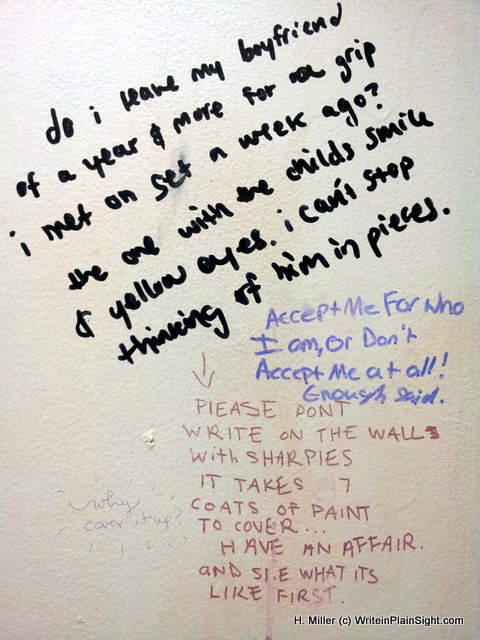 And yes, “why cover it up?” But does that apply to the Sharpie comments or the affair or both? Great story prompt.